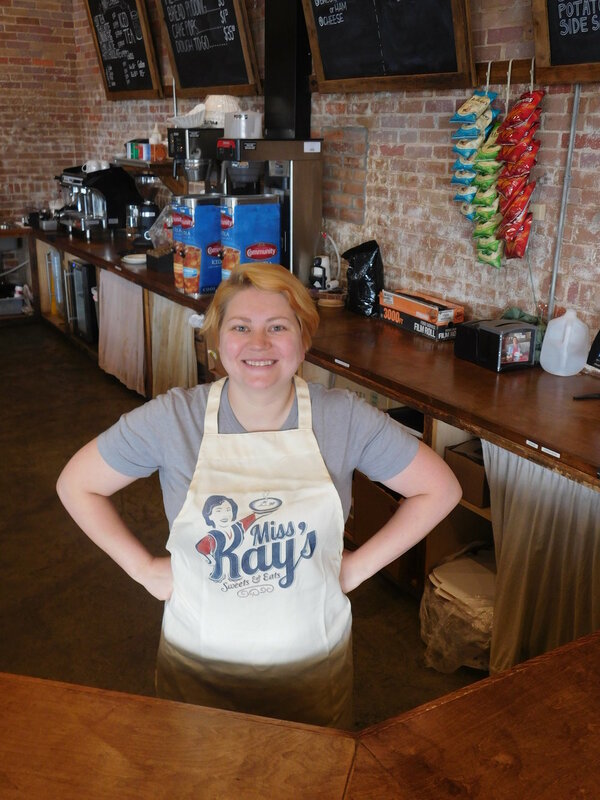 Miss Kay’s Sweets and Eats has become a staple stop for Antique Alley guests to enjoy coffee, espresso, sweets and great food made using Miss Kay Roberton’s recipes. Our facility fits a any style with intimate table settings, comfy couches and armchairs, and the beautiful, breezy patio. Miss Kay Robertson has spent her whole life gaining a well-deserved reputation for being a talented cook and homemaker. She spent her childhood watching her grandmother in the kitchen, dreaming of having a place of her own for the public to enjoy her home-cooked with love recipes. Finally her dream has been realized at 401 Trenton Street in historic downtown West Monroe. Alex is the daughter of Alan & Lisa Robertson, and the granddaughter of Phil & Kay Robertson. She attended Louisiana State University before attending and graduating from the Louisiana Culinary Institute with a specialization in pastry. During her time in Baton Rouge, she married Vince Mancuso, who has also spent his career in the food service industry in corporate management. Soon after they wed, the couple moved to West Monroe. Miss Kay always wanted an outlet to share her recipes and passion for cooking with the public. With her national reputation as a talented home cook, Alex’s education and experience in the field and Vince’s management background, the idea for Miss Kay’s Sweets & Eats was born. Jon Gimber is the son of Jim & the late Judy Gimber. Judy was the older sister of Phil Robertson, making Jon Miss Kay's nephew. He and his siblings lived their childhood in South Louisiana, learning to cook through many hours at the stove with his mother. He spent many summers and Uncle Phil and Aunt Kay's house, which was next door to Granny and Pa, Phil's parents. He learned hunting and fishing from an early age and his cousins Al, Jase, Willie and Jep were as close as brothers. He specializes in both Southern comfort food and traditional Louisiana recipes, though his capabilities extend far beyond those types and cooking in general. He is also a craftsman: an able woodworker, welder and handyman. His favorite part of cooking is sharing a legacy of love that he has been growing all his life, a legacy that often transcends cultural barriers when everyone is gathered around a table breaking bread together. The Lord has blessed him with a loving wife, Megan, and two children, Garrett and Hollis Ann.